In a gala event attended by some 30,000 people, with parades, fireworks, music, and speeches by world leaders – including U.S. President Barack H. Obama – the 19th Maccabiah Games kicked off Thursday night in Jerusalem. 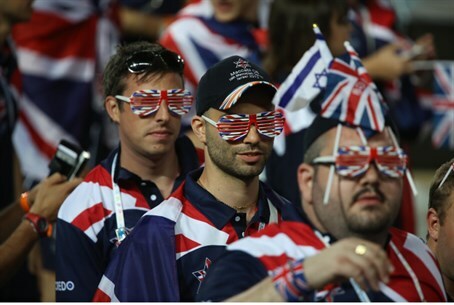 Over 9,500 athletes from 78 countries are in Israel for the Games. It's the biggest Maccabiah in history, with contests in 42 different events. Prime Minister Binyamin Netanyahu, President Shimon Peres, Jerusalem Mayor Nir Barkat, and other Israeli officials welcomed the participants. “This is your country,” Netanyahu said, proclaiming the opening of the games to the loud cheers of the crowd. The Maccabiah Games were conceived as a “Jewish Olympics,” with the first games held in 1932. According to historians, the year was chosen specifically because it was the 1800th anniversary of the Bar Kochva rebellion, the last major resistance put up by the Jews to Rome. The second games were held in 1935, with the next one taking place only in 1950, due to World War II and the Holocaust years. Since then, the event has been held every four years. The games consist of athletic contests in areas like swimming, running, track and field, and other Olympic-style events, and generally follow the rules of the Olympics – and in fact, are seen as somewhat of a staging ground for the Olympics, as several dozen athletes who participated in the Maccabiah later went on to win medals in the Olympics.